Twitter at war with rogue accounts - will the Ethereum scams be next? Twitter has apparently suspended over 70 million accounts since May. Observers are hoping that this major clean-up operation will soon target the recent plague of Ethereum scams. While the last few years have seen some high-profile cases involving trolls such as Milo Yiannapolous being banned from the platform, Twitter has been relatively slow in cleaning up what has rapidly become one of the most toxic spaces on the internet. In the wake of the investigation into Russia's alleged interference in the US election, the site has stepped up its efforts a little, showing that it is at least willing to change its policies when the stakes are relatively high. Crypto Twitter is one area where clean-up is arguably long overdue. This year in particular has seen a huge increase in the amount of crypto scams on the site. 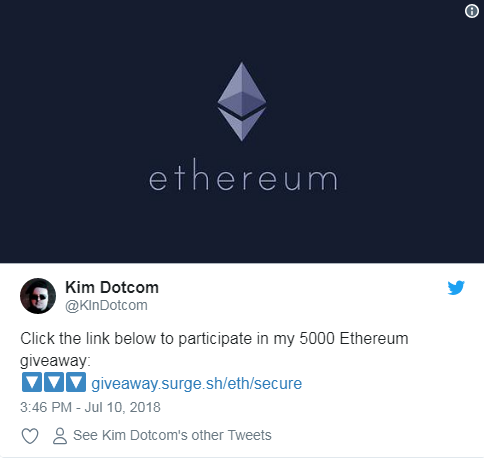 The most common scam involved a fake "Ethereum giveaway", offering a large amount of ETH tokens in exchange for a smaller amount. Fake accounts are created to post these scams, many of which have usernames that are very close to those of celebrities or high-profile users, allowing them to pose as these figures and lending the giveaways extra credibility. This scam is so prevalent that even major financial commentators are aware of it. CNBC Fast Money's Melissa Lee pointed out that Twitter should probably do something about it. @jack Now that $TWTR is cracking down on fake accounts, can you also shut down the accounts promising crypto giveaways? Elon Musk recently tweeted about these scambots, offering his praise for their ingenuity. Many of the fake accounts pose as Musk himself, as well as Ethereum founder Vitalik Buterin, who was less enthusiastic about them. Should Twitter be doing more to ban these crypto scammers?